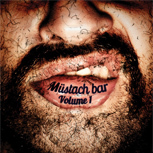 A vinyl compilation containing all the 2011/2012 jingles of the Müstach bar! And more than that, 21 additionnal jingles created and recorded by 21 amazing bands! Good news, the Müstach bar will come back this next summer. Some festivals are already planned, others have to be confirmed. Other news, a "Müstach bar jingles" compilation should be released this summer. After nearly a ton and a half of shaved beards, the Müstach bar takes deserved vacation! Tomorrow, we'll drive about 15 hours to go to Pula in Croatia for the 20th birthday of the MonteParadiso Festival. Yeeeha! The first festival of 2012 is over! Now we have lots of nice videos, pictures and jingles in our Multimedia section. Many people came to the Müstach bar, that was amazing. We simply deplore the death of two mowers and Yannick Noah, a friend of the team and a big fan of the Müstach bar. Rest in Peace bro. See you next Friday and Saturday (6th and 7th of July) at the Antinational fest! And of course, if you're interested by the Müstach bar to animate your concerts, festivals, veteran meetings or birthday parties, don't hesitate to contact us!